A bizarre ‘theft’ of free bottled water that was meant for the parched mouths of London Marathon runners has provoked an outraged online backlash against residents living along the race route. Around 40,000 people participated in 26.2 mile run, including well-known British astronaut Tim Peake, who digitally completed the marathon while on a treadmill at the International Space Station. However, while Kenyan athletes Eliud Kipchoge and Jemima Sumgong were the fastest runners, a group of parents and children were also quick off the mark in snatching crate loads of drinking water. 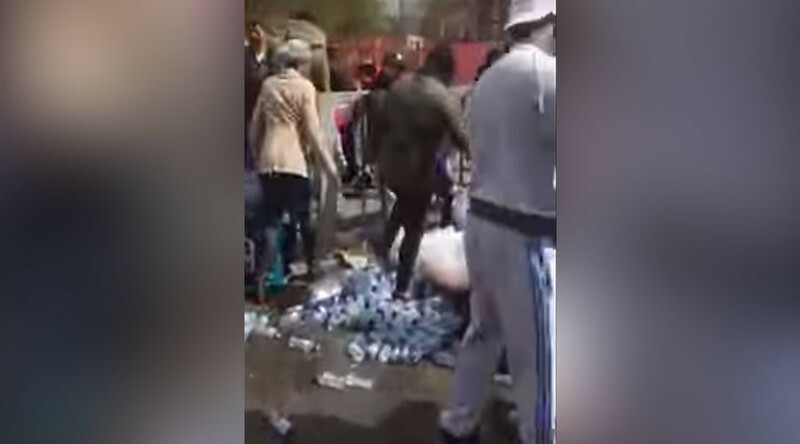 Video purportedly filmed near a marathon water station in Deptford shows scores of people racing to nab the bottles of water as the last of the runners passed. The 250 milliliter drinks were on hand at every stage along the route from Mile 3 to 25, according to the marathon’s organizers. People can be seen filling up trolley carts and bags with water that had been provided for free to the participants of Sunday’s event. “It’s very disappointing to see water being stolen in this way from the official water stations for our runners,” said Hugh Brasher, event director for the marathon, as quoted by the Daily Mail. While Virgin, the event’s organizers, say they recycle the empty plastic containers used by runners, it is unclear what happens to leftover water supplies. — Kirsty Leanne ✨ (@KirstyLeannee92) 24 апреля 2016 г. Just seen the video of the people stealing the water at the London Marathon. Total Scumbags. — Craig Robinson (@robo2124) 24 апреля 2016 г. — Robert Smith (@CashForSilva) 24 апреля 2016 г. How dare people take the marathon runners water. Such disrespect. — Rosabel (@TheBelRosa) 24 апреля 2016 г. Others have pointed out that since the marathon was nearing its end, the water was likely to be free to take anyway. — Amirah M'Harnie (@cinnamonlols) 24 апреля 2016 г.